I am now at by default one of the best places for me to live on planet earth, I have voted for it too many times to ignore. 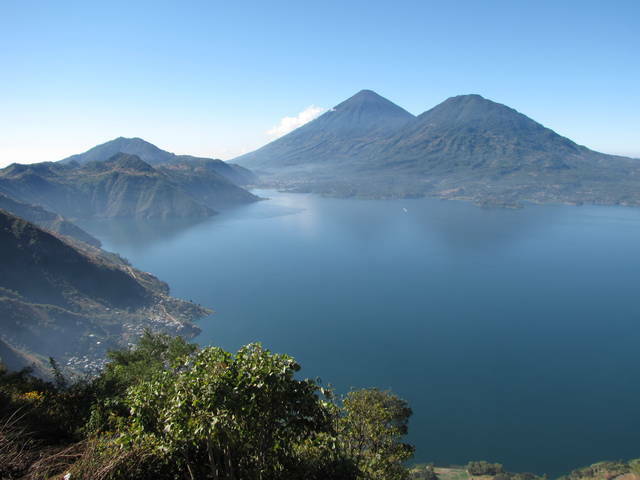 I have visited Lago Atitlan many times, that is how I vote for what I like in life, I go do it. "Andy, what do you like to do for fun?" "Walk around in Office Depot, looking for Gadgets." I go there a lot, I must enjoy it, because I repeated the same action many times. I have this obsessive, compulsive desire to simplify my life, therefore I was always searching for some organizational things to be more effective and efficient. 1. Watch my money, the place is so cheap, I am a millionaire by default. 2. Prioritize, it is small enough, I can walk the place. 3. There is no need to work, that is for the losers in life here. I think I just said no, I rejected a lifestyle of complicated crap, and moved on. "Why do you get so angry or frustrated with readers, or when you write?" Passion in and Passion out. The passion you put into something, will beget the passion you get out. I am in love with the life I live, and know there a few, a very few, I mean maybe 1 in 10,000 who can sense there is something better out there. I put my heart out, and of course I do not like people trying to step on it, but I am big boy, an readers know that, they do not believe they can hurt my feelings. I will get over it, but I must allow myself to feel or I am just another idiot. I guess, I know I am a target, I get personal, I write about my personal life, I do not write some off the wall advertisement to get you to pay 500 USD a night to get to travel to impersonal five star resorts for a one night love affair with youself, I call it a lot of money to not find any friends. What is it when you give yourself pleasure alone? Most people cannot have friends, because face it, they are too scared to be a friend, they are too scared to say this is me, why, same as all the readers comments. There are too many idiots out there, that want to derive evil pleasure by trying to talk about other people. There are too many Michael Moore’s on the planet, too many people who spend their whole life make defining themselves as the critique of others. George Bush made Michael Moore, because he did something that Michael could complain about. And Hitler used the Jewish people to make him a leader, all a bunch of crap. I love Pana, I love the simple people here, but I also love the stories of debauchery in Sosua, they both are real life, but two side of the coin, it is the same coin. If you allow people to talk, and do not try to change them, they will tell you tons of wild stories because they will believe you agree with their lifestyle. Everyone tries to change their friends, including me, and sometimes I just give up and stop. Go do something that will define you today, I am lying here freezing in Pana at 1500 meters, and I am going to finish a book. What are you doing today, reacting to everyone around you? Or allowing them to react to you, are you the story, or is someone else’s life the story of your life. As always, you are invited to Paradise here, but I am not your tour guide.